The CS3209B joystick actuator and the associated cable are now available as a kit for direct sale to end users. There have been a growing number of inquiries from law enforcement agencies who have aquired MRAP vehicles from the Department of Defense under the LESO program to provide them with replacement turret control actuator joysticks, since the original actuator was removed from the vehicle during decomissioning. 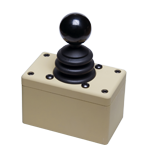 Click here to order the accompanying MIL-grade cable to connect the joystick to the BPMTU/ITDS controller. These prices are one-off quotations based on our contract with the Defense Logistics Agency for NSN #1290015524497.